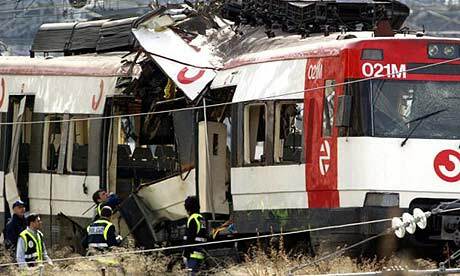 In the morning rush hour of 11th March 2004, 10 bombs packed with dynamite and nails simultaneously ripped through four rush-hour trains packed with office workers, schoolchildren and others heading for the centre of Madrid, causing carnage and devastation. Commuters described appalling scenes of mutilated bodies and seriously injured passengers, including young children, lying in the mangled wreckage of trains. The bombs, planted in rucksacks and triggered by mobile phones, killed 191 and left more than 1,800 injured in the biggest terrorist attack in mainland Europe. Three other bombs failed to go off and were later deactivated by explosives experts. In the immediate aftermath, the then ruling conservative government of Prime Minister Jose Maria Aznar blamed the attack on the armed Basque separatist group Eta. Then police discovered a van with detonators and a video claiming the attacks for al-Qaeda. With the bombings coming just three days before the nation went to the polls in the 2004 general election, Spaniards became convinced that the attacks were a reprisal for their involvement in Iraq. After months of polls predicting Mr Aznar would win another term, the traumatised country voted in the opposition. It later emerged that the bomb plotters, a group of young men mostly from north Africa, were assisted by a gang of Spanish small-time criminals who provided the dynamite needed for the attacks. The two groups – one terrorist, one criminal – came together through a series of coincidences and loose connections. An associate of the plotters had spent time in prison with one of the members of the criminal gang, so when the terrorists were looking for dynamite to purchase, he was able to put the two sides in contact. After a long manhunt, the Spanish police surrounded a flat in Madrid three weeks after the bomb attacks, where seven of the ringleaders were hiding out. But the terrorists had been tipped off and as the police moved in, they blew themselves up, taking vital evidence with them. Among those who died were Serhane Ben Abdelmajid, the mastermind behind the plot. At least four other suspects, including two were central to the attack escaped. One later died in a suicide attack in Iraq. The figure that drew most attention at the subsequent trial was Rabei Osman, who operated as a link between the Madrid bombers and other terrorist groups. Osman was arrested in Milan in June 2004 after admitting in wiretapped conversations that he planned the train bombings.